A little piglet ready for her play. On one hand, I love browsing through all of the perfectly executed DIY projects. Who knew there were so many things you could do with a Mason jar? And toilet paper roll wall art…wow! On the other hand, all of the beautiful Pinterest crafts make it look oh so easy. And here’s a little secret. I most definitely do not fall under the category of “crafty momma”. Occasionally, I make crafty things. More often than not, I half-make crafty things that don’t look anything like what they are supposed to. Stay tuned for pictures…I’m sure many Pinterest fails will appear in the future on this blog. The final detail is bringing your child’s character to life through costume. Please use your imagination by giving new life to old clothing and accessories. Talk to your child about his/her character, and create an original design (without purchasing a prepackaged costume). Don’t get me wrong. I love unique and original. I love handmade. I just love it more when it is handmade by someone else. Of course, where is the first place I look for inspiration? You got it…Pinterest. Enter Pinterest stress. Also known as social media anxiety disorder. Seriously, it exists! Luckily, combing through the perfectly sewn squiggly pigs, tutu pigs, pretty pigs, and crocheted pigs, I came across Peppa Pig. Kim at seven thirty three came up with this very cute pig costume ensemble. Not too elaborate, and easy to substitute a hot glue gun for the sewn parts of the tail. As a family, we sat down yesterday to try it ourselves. I did the measuring and cutting, Dr Daddy handled the glue gun, and M helped make the nose. End result? 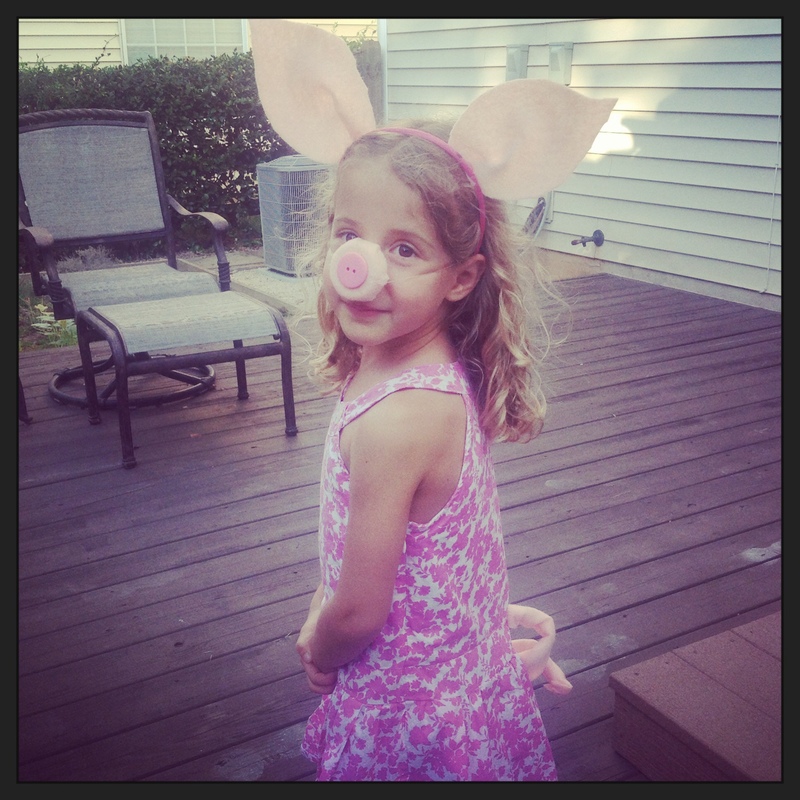 One little piglet costume-ready for her play. A Pinterest success!